Microfiber safari hat, 2 1/2" brim, neck flap, mesh crown, moisture wicking sweatband, green under brim, reflective edge, chin strap. One size fits most. 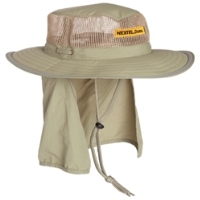 Neck flap folds up into brim with velcro closure when not is use. Pocket inside crown top with velcro closure. Khaki. EMBROIDERED PATCH NOT INCLUDED.